72 years ago today we believe that Edith Stein - feminist, atheist, Jew, Carmelite and Catholic - went to her death in the killing fields of Auschwitz (we cannot be sure of the exact day but think it must have been August 9th 1942). Of all the saints of the confused and confusing 'short twentieth century' she is one of the most complicated. Born of a devout Jewish family in Breslau, Germany, Edith developed an early love and skill in philosophy which was to remain with her throughout her life. The greatest influence on her philosophical development was the work of Edmund Husserl and the newly emerging phenomenological school. From her Jewish faith Edith turned to atheism, although always with a lively interest in the ‘God question’. In the dialogue between the Orthodox bishop, Tikhon, and the enigmatic Stavrogin in Dostoevsky’s 1872 novel The Demons, Tikhon informs the unbelieving Stavrogin that: ‘A complete atheist stands on the next-to-last upper step to the most complete faith’. This quote could have been directly applied to the young Edith. In all her atheistic questing she sensed the importance of the divine perspective for all phenomenological research. The key moment of her conversion occurred in 1921 when she stayed at the house of some friends, the Conrad-Martiuses, at their home near Bergzabern. Wanting some reading for the evening she looked through the bookshelves of her hosts and found Teresa of Avila’s ‘Book of the Life’. She was not able to sleep that night and was completely gripped by the narrative that Teresa presented. Afterwards she would say of Teresa’s book: ‘This is the truth’, finally she had found what she had been looking for (See Herbstrith 1992:65). As she would write later ‘It is just the people who at first passionately embrace the world who penetrate farthest into the depths of the soul. Once God’s powerful hand has freed them from its allurements, they are taken into their innermost selves’ (From ‘Die Seelenburg’ in Welt und Person: Beitrag zum christlichen Wahrheitsstreben, Stein 4:66). Once Edith had found ‘the treasure hidden in the field’ she went away, sold everything she had and bought the field. She was baptised a Christian in 1922 and began an extended study of the Church Fathers and scripture, especially the works of St Thomas Aquinas. The next ten years were ones of teaching and work to reconcile Christian and atheist philosophy, in particular the phenomenology of her ‘master’ Husserl and the high scholasticism of Thomas Aquinas. Perhaps the most remarkable fruit of this time is the delightful Festschrift she wrote for Husserl’s seventieth birthday, What is Philosophy?, where a tired Husserl slumps down on his sofa after a long day lecturing only to be surprised by the shade of St Thomas Aquinas who then proceeds to question the master on the nature of phenomenology and God (reprinted as Knowledge and Faith, Edith Stein, Collected Works, 8). Husserl would end his days a Christian having experienced a deathbed conversion in 1938. On hearing the news, Edith, just about to take her solemn vows in the Cologne Carmel, wrote to another sister: ‘As regards my dear Master, I have no worries about him. To me, it has always seemed strange that God could restrict his mercy to the boundaries of the visible Church. God is truth, and whoever seeks the truth is seeking God, whether he knows it or not’ (Stein, Letter 259, quoted in Herbstrith 1992:139). From the original fathers on the Jewish mountain of Israel, to the converso Teresa of Avila and John of the Cross, and now in these words Edith summarises the Carmelite charism of openness to all cultures. For her, and for all true Carmelites, God’s saving action does not stop at the doors of the church but extends to all humanity in all its suffering and confusion. For Edith, this would become a terrible reality as the Nazi persecution of the Jews gathered pace and the net slowly closed in on her and her family. Despite her conversion to Christianity she was still a target for Nazi persecution and after the horrendous events of Kristallnacht on November 8th 1938 she was forced to leave Germany to seek shelter with the Carmelite community at Echt, Holland. Despite the persecution throughout all this time Edith was able to continue her philosophico-theological writings on the interface of phenomenology and theology. We are fortunate today that most of them have been or are being translated in the splendid series of her writings published by the Institute for Carmelite Studies in Washington. What they reveal, and scholars are still working hard on interpreting them, is a woman who grasped the essence of Carmelite spirituality in all its intellectual depth and existential consequence. Since her student days Edith had been fascinated by the ‘nature of empathy’, and in fact had written her doctoral thesis on the subject (published as On the Problem of Empathy in The Collected Works, 3). Commenting on this interest, Roman Ingarden writes that ‘What interested her most was the question of defining the possibility of mutual communication between human beings, in other words, the possibility of establishing community. This was more than a theoretical concern for her; belonging to a community was a personal necessity, something that vitally affected her identity’ (Ingarden 1979: 472 in Herbstrith 1992:146). Perhaps, as Edith realised, our hope as alienated, atomized, late capitalist individuals, lies in the return to community as the manifestation of our essential natures as homo empathicus. 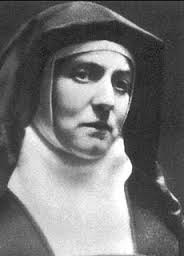 Edith went to her death at Auschwitz on August 9th 1942, the day on which she is now celebrated as Saint Teresa Benedicta of the Cross since 1998. From the mountains of Palestine to the Gates of Auschwitz the Carmelite calling can be seen as one that places the individual into the deepest and most intimate relationship with God as a call to radical personal transformation. From this transformation arises the need to seek God in all his beloved children, regardless of race, creed or religion. As we have seen, Carmelite spirituality transcends the boundaries of any small creed or sect to present a universal call to holiness. As I read the daily terrible news from Iraq, Israel, Palestine, Ukraine and see a scramble to 'take sides', not only abroad but amongst my own friends and colleagues at home I pray that we might follow the example of this remarkable woman, who was able to cross boundaries between faith and creed, whilst retaining her integrity and orientation of life towards the fullness of life that is God. She entered Carmel in 1933 having considered vocations with the Dominicans and Benedictines. See, for example, Alasdair McIntyre’s recent Edith Stein: A Philosophical Prologue, 1913 – 1922. London: Sheed and Ward. 2007. From ‘Weihnachtsgeheimnis’ quoted in Herbstrith 1992:154. As Kierkegaard called it in his critique a hundred years before, another significant influence on the young Edith. From the Kölner Selig- und Heiligsprechungsprozess der Dienerin Gottes Sr. Teresia Benedicta a Cruce – Edith Stein (Cologne 1962:92) in Herbstrith 1992:180.